A cheerful John Bull aesthetic defines this exuberant Regency Townhouse in Bath’s formidable Queen Square. A boutique hotel with a difference. The Francis Hotel is bang in the heart of Bath City Centre making it ideal for exploring the historic city’s many stylish boutique shops and restaurants. A pleasing blend of the contemporary and traditional, the hotel’s bright and spacious bedrooms are equipped with TV, radio, 24 hour room service, hairdryer and mini-bar. Dine in the on-site ‘Square Restaurant’ - which serves a tasty A la Carte Menu - or drift into the Wood Bar to catch up with friends or colleagues over a drink or a bite to eat. Mini Suites are also available. A daring, colourful streak adds an eccentric dimension to this elegant Georgian Townhouse: from the black and white mosaic floor in the hotel lobby to the vibrant purple tones in the suites staying here is a memorable experience. 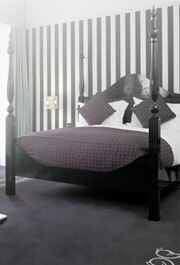 Rich, heavy drapes and regency furnishings provide an elegant depth to the bedrooms. Art and décor celebrate the cheerful exuberance of the late Regency period. The Liing Room offers a quiet sanctuary for pre-dinner drinks and a little privacy. Suites include The Superior One, The Feature On and The Classic One.